A Hawaii Big Island Travel Guide Book: Worthwhile Buy? Do you need to buy a Hawaii Big Island travel guide? If so, which one should you buy? It seems like there are two types of travelers (well, there are probably a lot more, but for our purposes here, two types will suffice). The first type of traveler loves to fly by the seat of their pants when they travel. These travelers love the journey as much as the destination and welcome unexpected changes in plans as part of the adventure of travel. These travelers also have an aversion to excessive planning for fear of losing the fun of being spontaneous. The second type of traveler is the planning type. These travelers live and die by the itinerary. They have perfected the art of maximizing their leisure time and, because of their precise planning and attention to details, they are rarely disappointed when they travel. So, you probably think I'm going to say that the first type of traveler should skip the guide books and the second type should buy all of them. Well, not so fast. Honestly, I think that being well informed is a quality that suits all kinds of travelers. And a good Hawaii Big Island travel guide book can help you get the most out of your experience on the Big Island no matter what kind of traveler you are. A good travel guide will leave you much better informed and, hopefully, at least a little bit entertained. So a guide book should be more than a Yellow Pages directory of local businesses, restaurants, stores and hotels. It should help you get to know something useful about your destination by sharing more than just the facts. The best travel guides are full of personal stories and advice based on experience. And great travel writers know how to communicate valuable information in an entertaining way. It used to be that you had only a handful of choices in terms of travel guides. You would go to your local book store and choose one from the few titles that they had in stock at the time. AAA was another reliable source for members. These days, the options are practically endless. The internet has opened up a world of new options for travelers looking for information. Countless travel websites and mobile apps provide their take on every possible travel destination. 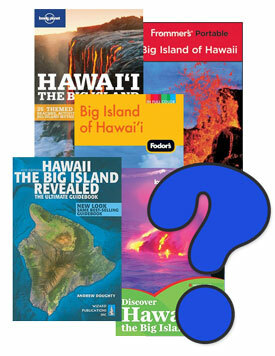 Plus online booksellers now offer literally thousands of titles for travelers looking for a Hawaii Big Island travel guide. On a related note, it's because of the rise in electronic resources that you've found this web page and I hope that you will get a lot out of this free resource when it comes to planning and enjoying your time on the Big Island. The goal of this site isn't to be an exhaustive Hawaii Big Island travel guide, rather to give you a personal account of some of the best of the Big Island. 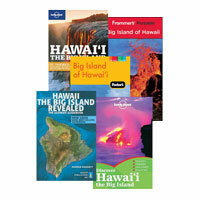 So, for a trip to Hawaii, is a Big Island travel guide book a good purchase? Well, if you're like me, there's something about a real book that you can stuff in you bag that is just a lot of fun. And, if you're not so nostalgic about a good old fashioned paper book, there are electronic versions of most books available for your favorite e-reader. But beyond that "something" about a real book, the advantage of a good guidebook is that it can be a fun and informative read. Whether you hope to use a guidebook as your go to "travel Bible" on the Big Island, for everything from dinner recommendations to hotel reviews, or you just want to have something enjoyable and informative to read on the plane, a good guidebook can help you out. When it comes to guidebooks and apps for the Big Island of Hawaii, there's one title that stands out from the crowd. Find out why I love Hawaii The Big Island Revealed. The best of the rest when it comes to guidebooks. Many are available as both good old paperbacks and eBooks. Out of the dozens of Big Island smartphone apps available for iOS and Android, there are a few gems (free and paid) that stand out.